So after over 2 months, I’m really happy with the way everything has grown in. The impatiens completely melted, as did most of the selaginella, but everything else is doing great. The ficus has completely recovered and is growing in very well. It’s grown down to the bottom, anchored, and is starting up the back wall and cork tube on the right. I added an airplant that seems very happy. It’s stuck in a little groove in the cork bark right by the vent so it can dry out completely. And then, June 12th, I got frogs! 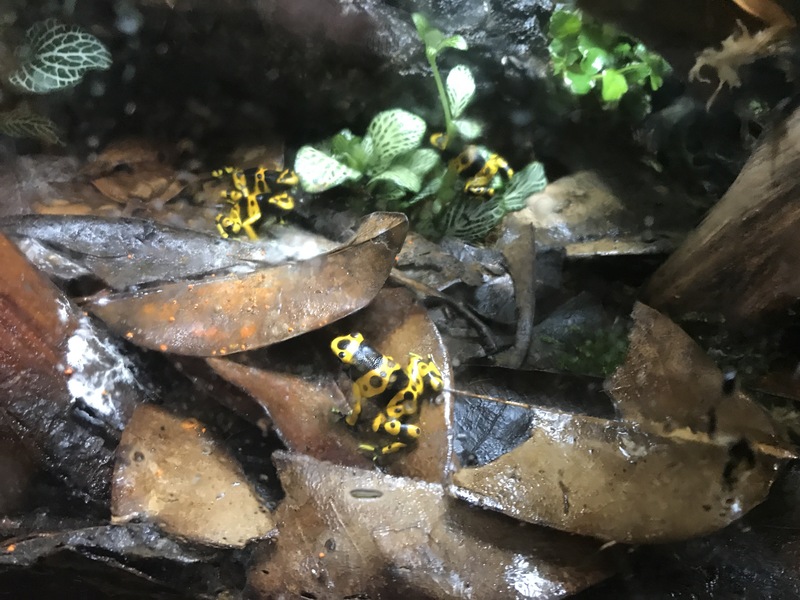 This is a group of four dendrobates leucomelas froglets that are about three months out of water. So excited! 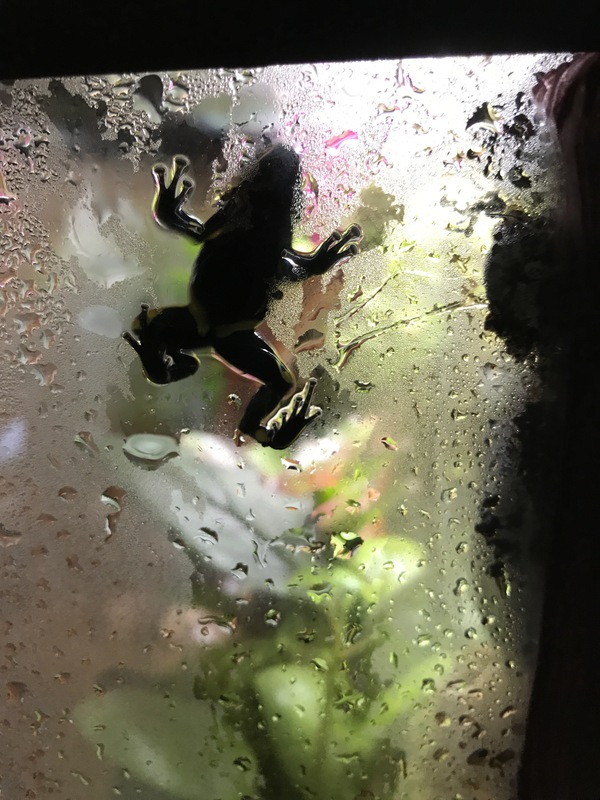 Author annaPosted on June 16, 2017 Categories UncategorizedLeave a comment on Vivarium update 2+ months and frogs! Two and a half weeks grown in! The springtails population is booming, so that’s cool to watch. The plants almost all have new growth, the ficus pumilla is struggling for some reason. I did lose one fern, apparently it didn’t like the humidity but the other two look good so far, and one put out a new frond. 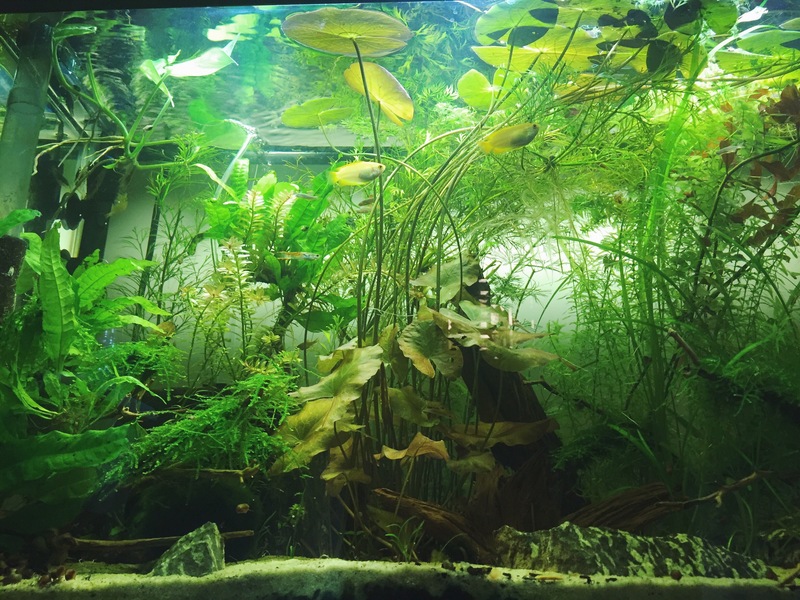 The creeping Jenny gas exploded, I may need to start trimming it soon, best cascading plant ever! 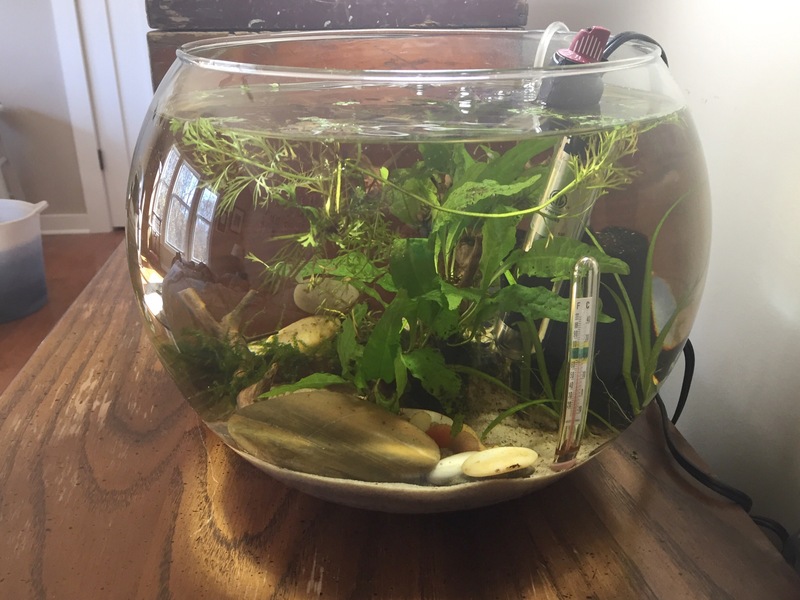 So versatile too, I have it growing submerged in my fish tanks. The Selaginella is really doing well in the front corners, and the Fittonia was evidently made for vivariums. The Peperomia has adjusted and I see some new leaves on the bigger of the two plants. The Trandescantia likewise seems very happy and has started growing across the front. If the ficus doesn’t make it, I may just allow the Trandescantia to take over that side as well. 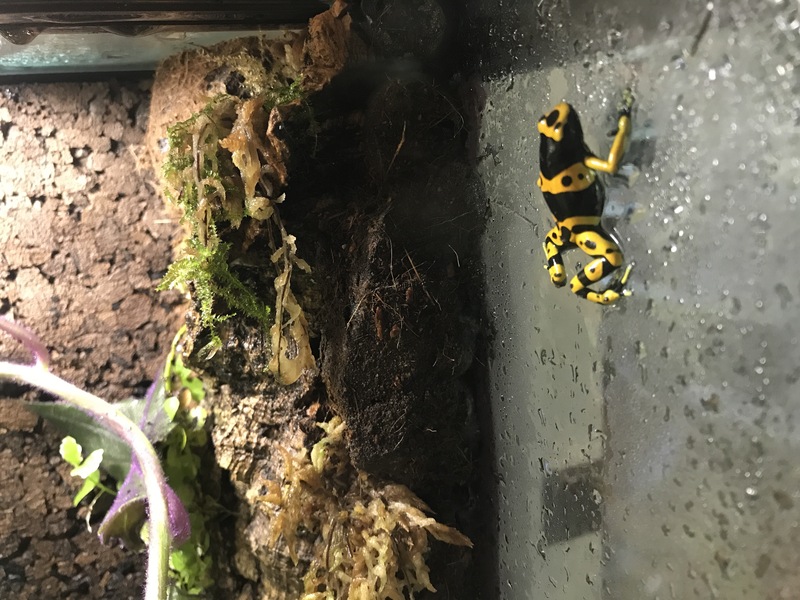 Welcome to my latest obsession: Dart frog vivariums. 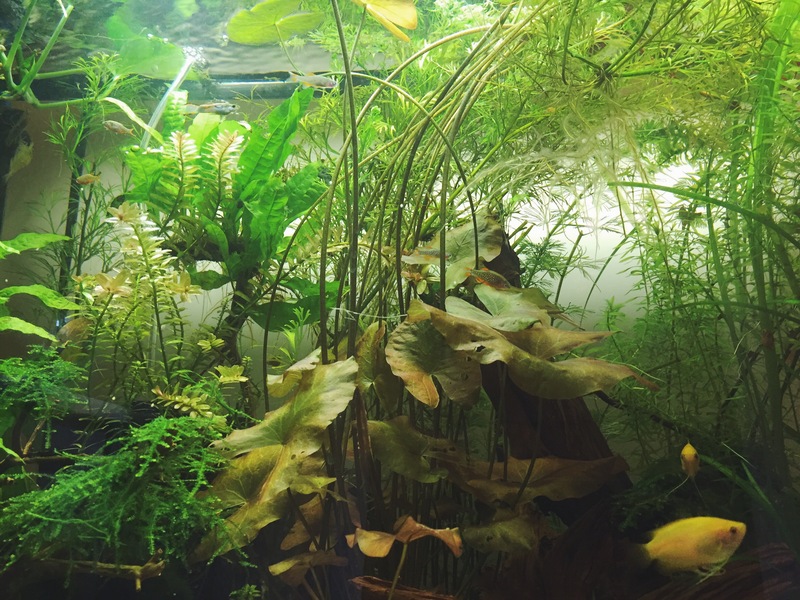 I have created a tiny jungle in my home in a 29 gallon aquarium. No frogs yet, but here is an actual build post with pictures of almost every step! Shocking, I know! 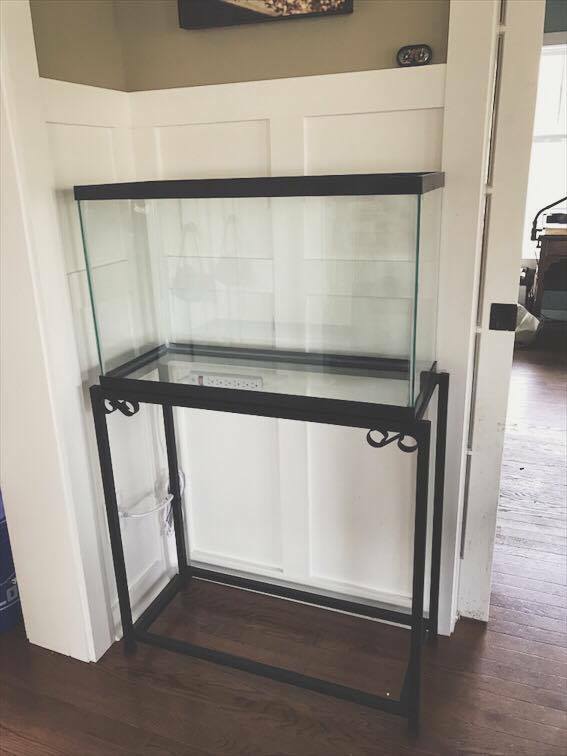 April 2, 2017: Petco Dollar per Gallon sale started and I grabbed the last piece I needed, the tank. 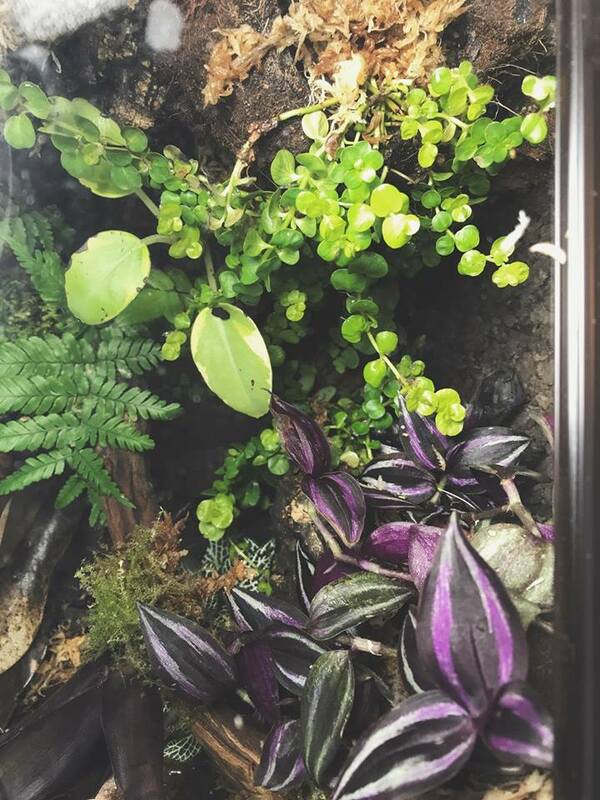 I’ve been collecting plants and supplies since January. 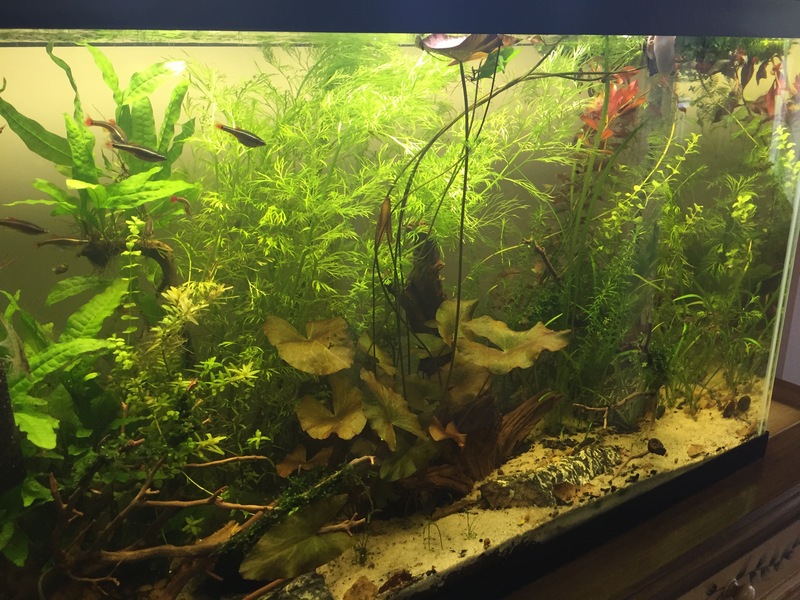 I did buy most of my plants at my local nursery and Lowes, but I grew almost all of them for several months outside the tank and all of them were completely bare-rooted and washed before putting them in the tank. April 3rd: my day off! I started the background build by siliconing these flat, pressed cork panels and pieces of egg crate to the sides and back. I got the cork panels from Glass Box Tropicals and the egg crate is sold in the lighting department of home improvement stores, it’s a lighting diffuser panel for commercial fluorescents. 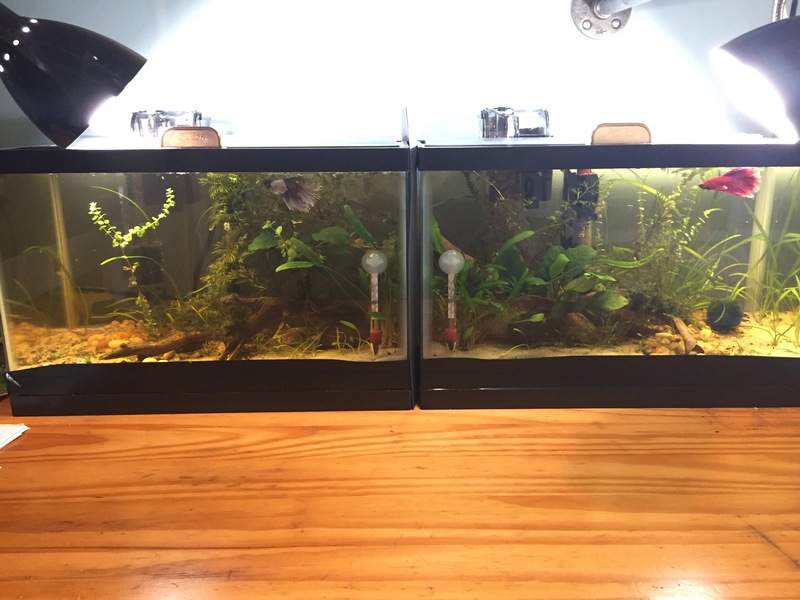 I used clear GE silicone I for this stage as it’s easy to source and less expensive than black aquarium silicone. Also after reading a gazillion Dendroboard build threads, I had plenty of evidence that it was safe for animals. 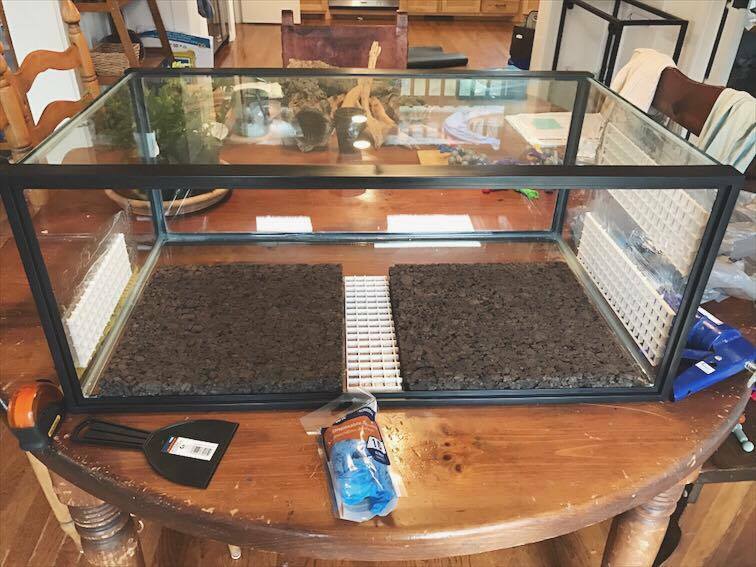 The false bottom is a 2 1/2 inch deep box built out of egg crate (with egg crate supports in the middle as well), covered with landscape fabric. I tested my fabric to see which direction it drained the best before wrapping the false bottom. I cut small slits and used zip-ties to attach. 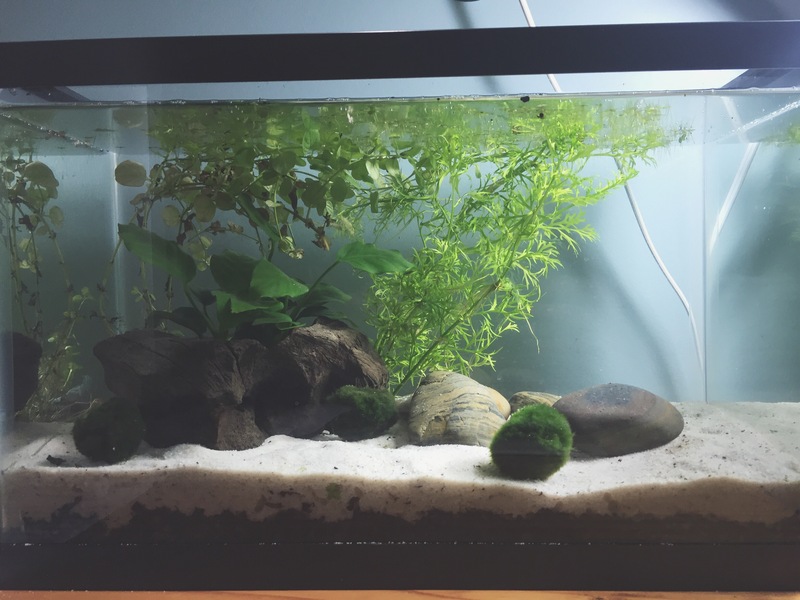 It’s smaller than the bottom of the tank because I decided to hide it with aquarium gravel around the front and sides. 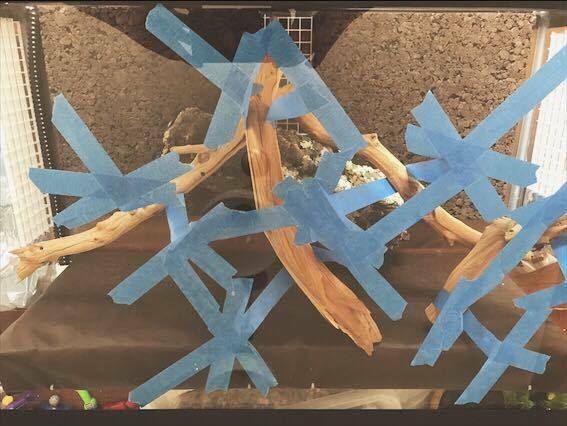 While it cured (it says 24 hours for full cure), I used painter’s tape to suspend the manzanita where I wanted to foam it. I glued the cork tube to the cork panels with some silicone as well. 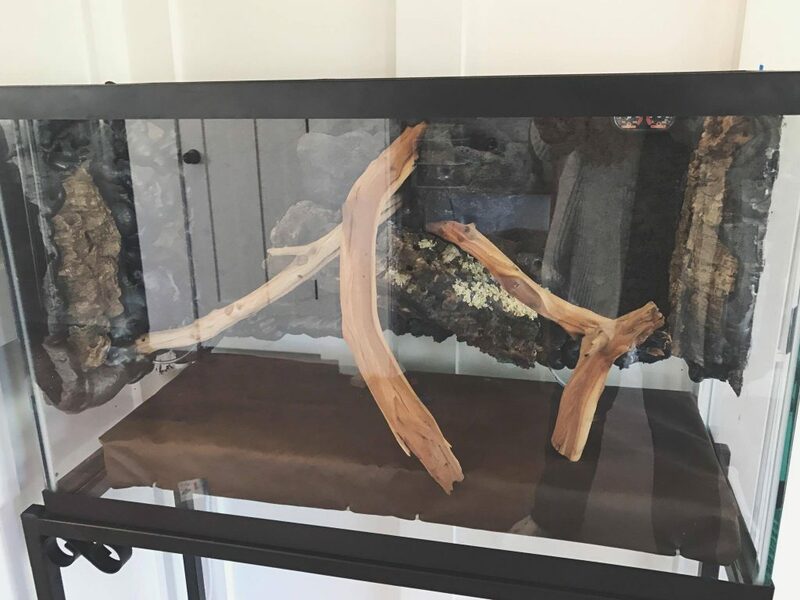 Cork tube and flat panels from glass box tropicals, large center manzanita branch from glass box, other two pieces from Josh’s frogs. Small extra manzanita was a freebie from Glass box. It took a LOT of tape, but I had the branches exactly where I wanted them for foaming. April 4th: Let the foaming begin! I used Touch ‘n Foam Landscape foam after watching a half dozen or so of Grimm’s Youtube videos on his builds. I have to say, I found it very easy to control and it’s hard enough to carve in about 12-18 hours. It says 12 hours for full cure on the can, but I think some of my spots were thicker than the application the manufacturer was envisioning. I also ran out with just one can after the back and the left side were complete so I had to order another from Amazon and wait three days. 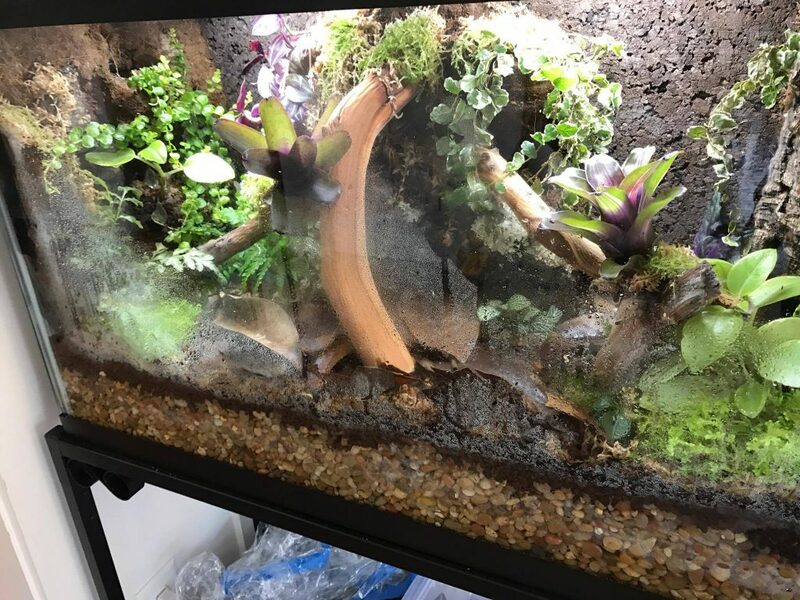 On the far right of the pic below you can see where I siliconed a 3/4″ pic pipe fitting slightly off the bottom of the tank, and a 1/2″ water pump pipe from Josh’s frogs. This lets me add water to the false bottom (with a funnel in the top) or siphon it out (by pushing airline down the pipe) if it gets too high. I’ve tested both and it works. I jammed a little square of aquarium filter sponge next to the pip to prevent any gravel from getting back under the space I’d left for water access. April 7th: The minute the UPS truck delivered my foam, I foamed in the left side. I’d already carved the back and right side on the 5th, so then it was just a matter of waiting until the next morning to carve the left. 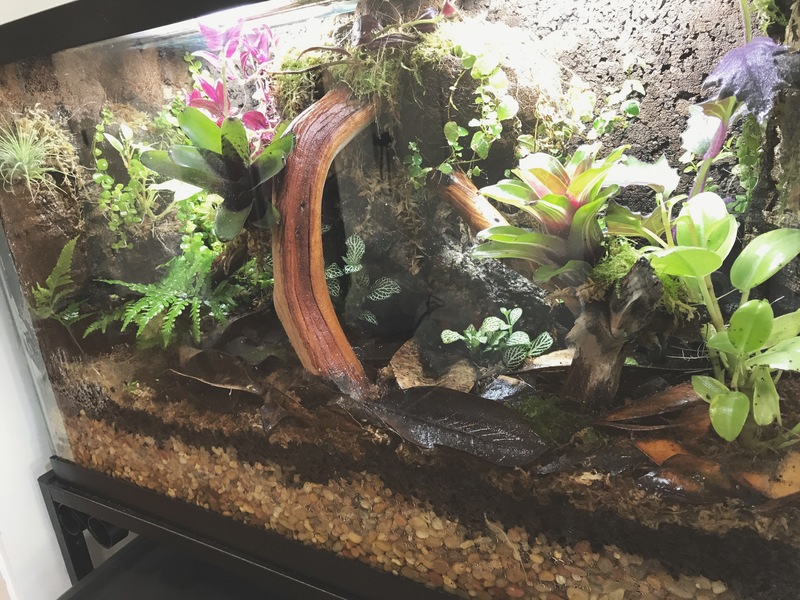 April 8th: Big vivarium work day! I got up early and carved the left side. It felt as dense as the rest of the foam now, so I went ahead and did the silicone and cocofiber step. 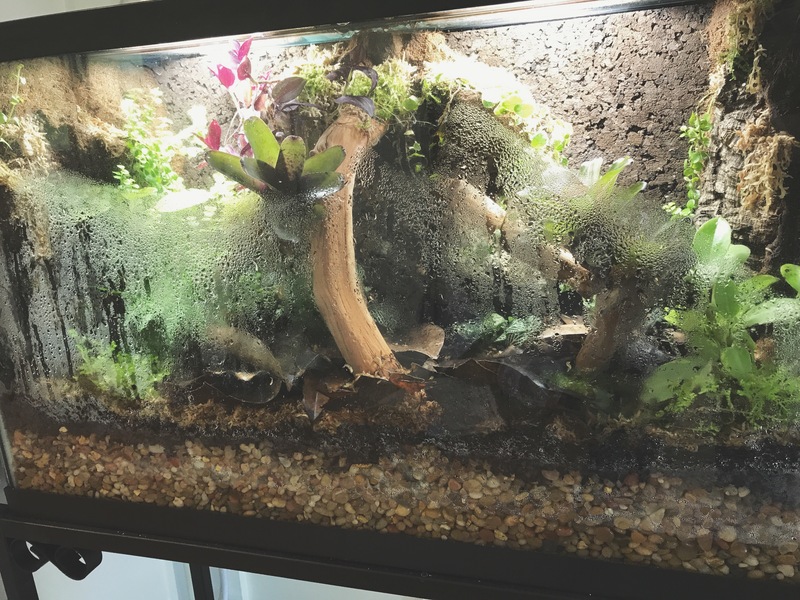 I used black aquarium silicone for this (one tube and I still have some left), and coco fiber from Josh’s Frogs. 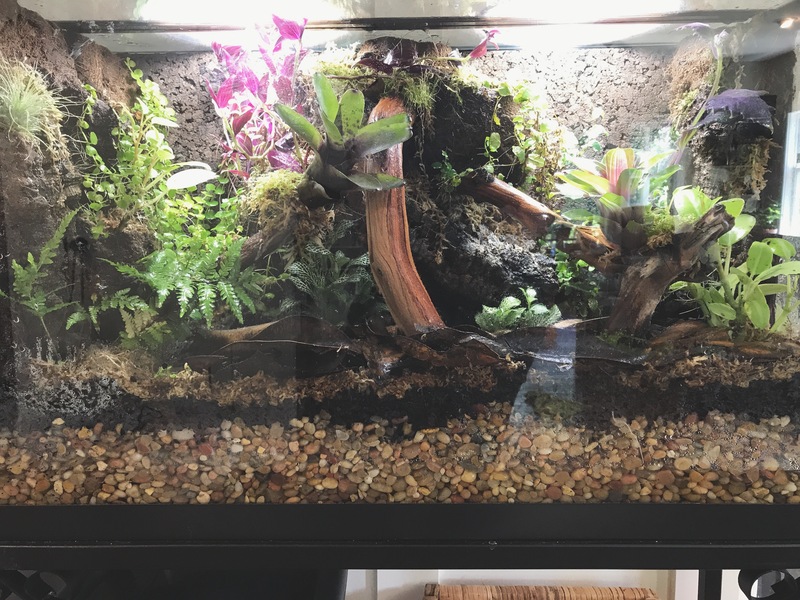 I foamed a small wall in the back left so I could add orchid bark to the ABG substrate to try to give the ferns a better spot to grow, we’ll see how that goes. 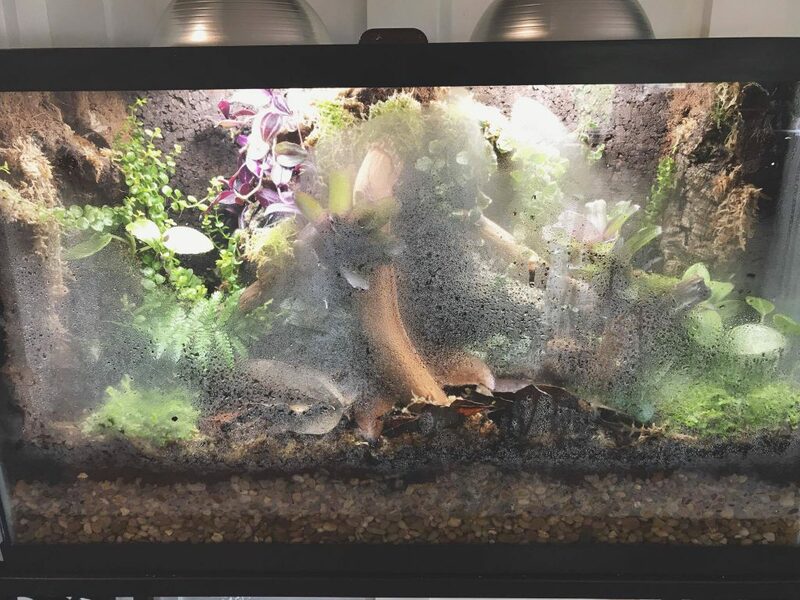 It keeps their substrate a little more separate from the rest of it. Orchid bark and ABG from Glass Box. 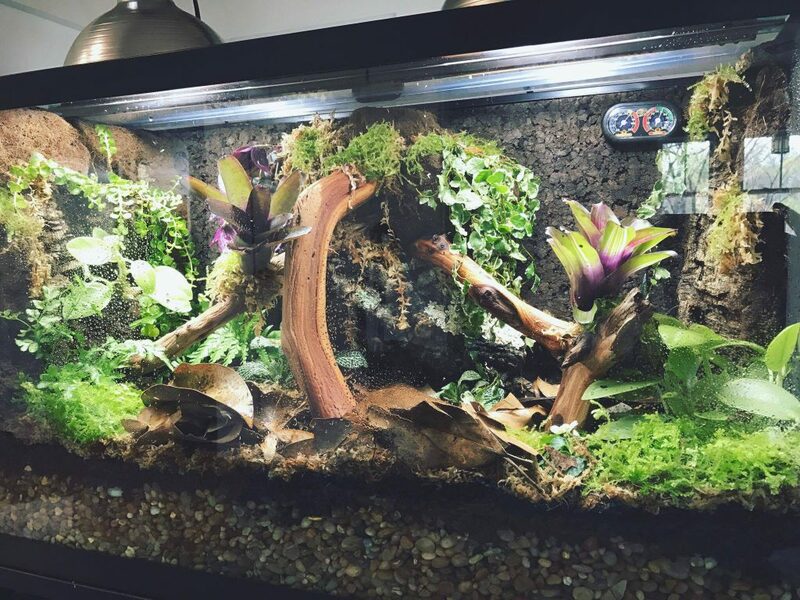 Added more orchid bark around all three edges to provide a slight barrier between the ABG and the glass and gravel. My thought was this would prevent the smaller particles of ABG from falling into the gravel, so far so good. 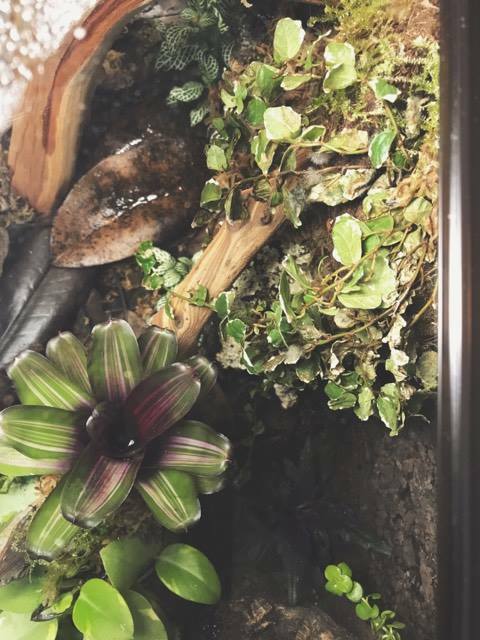 ABG was seeded with temperate springtails and dwarf purple isopods from Glass Box. Plant list: golden creeping Jenny, peperomia, fittonia, Tradescantia pallida, ficus pumila variegated, 3 ferns I’m not 100% on the ID, selaginella, genera aurantiaca, impatiens, and the two bromiliads are n. rubrifolia on the left and n. zoe on the right. For the lid, I bought a standard Aqeuon Versa Top and some no-see-em mesh. I cut an inch and a half vent out of the plastic strip that they include to modify for filters and such, and then I hot-glued it to both sides of the plastic strip covering the cut-out. 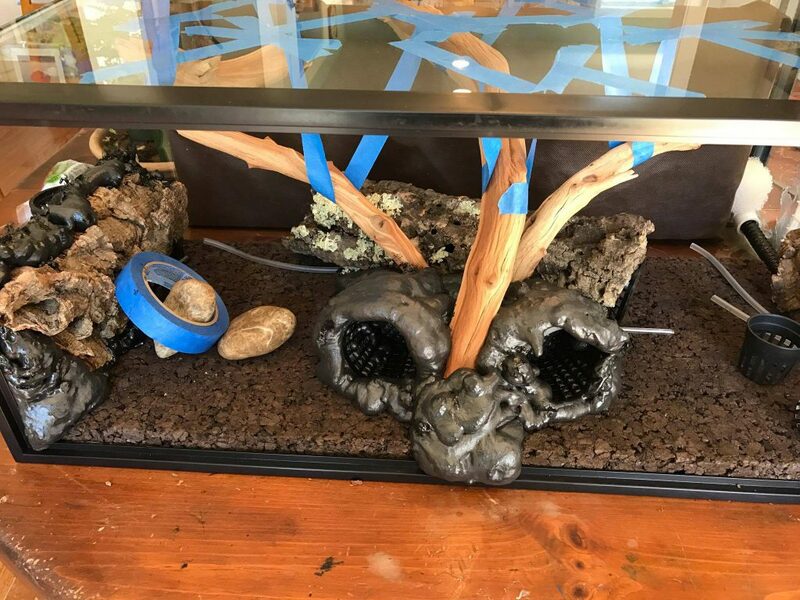 I used the GE I silicone and attached it to the front of the vivarium. Then I wrapped the entire glass part in wax paper and ran a bead of silicone around the rest of the lid. I pressed the glass top into the bead and wiped away any excess. After it had set up for a few minutes, I took the top back off, and let it cure. That creates more of a seal for the glass lid and fewer places for fruit flies to escape. It also lets me scoot the glass forward into the plastic strip for support and it won’t slide back without some pressure. After one week: Lost a few leaves off the peperomia on the left and off the ficus, plus one whole ficus cutting, I replaced it with some creeping jenny cuttings on the right. One of the ferns looks brownish, but has new growth on the bottom, I knocked it over so I went ahead and swapped with with one from the back that was doing better, we’ll see if it makes it. Humidity looks good, needs a misting every 1-2 days to maintain this level of fog on the glass. The no-see-em mesh actually prevents a good deal of air from escaping as compared with the open slit before the mesh had come in so I don’t foresee the need to cover that up. Misc: power strip attached to wall beneath tank with Command strips, plastic putty knife to spread silicone, no-see-em mesh for vent, 1 egg crate panel, 1 3/4″ PVC pipe fitting. 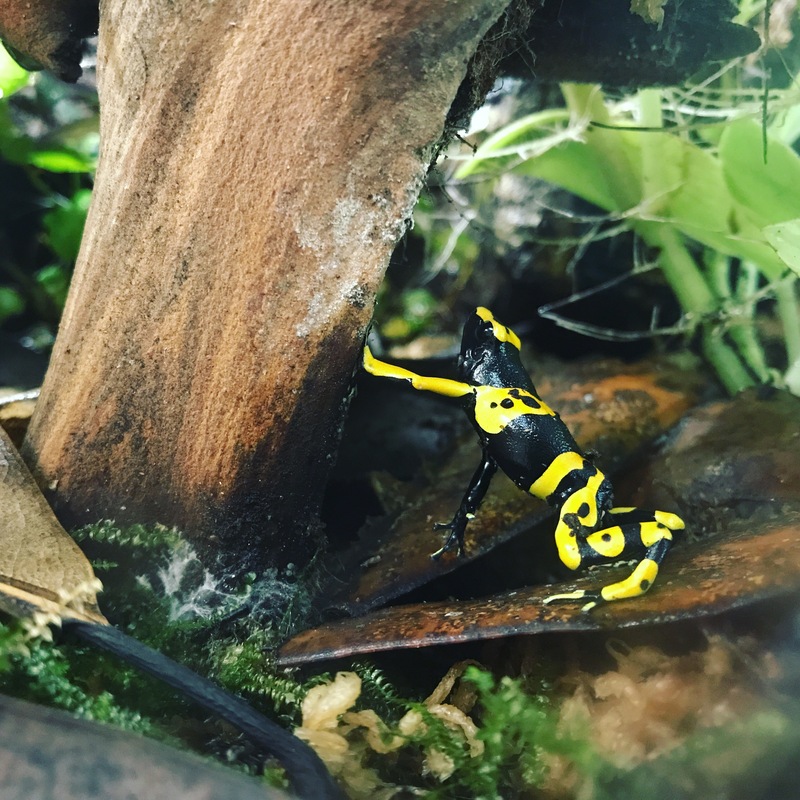 Author annaPosted on April 15, 2017 Categories UncategorizedLeave a comment on Vivarium Build! But I’m loving how it has grown in! 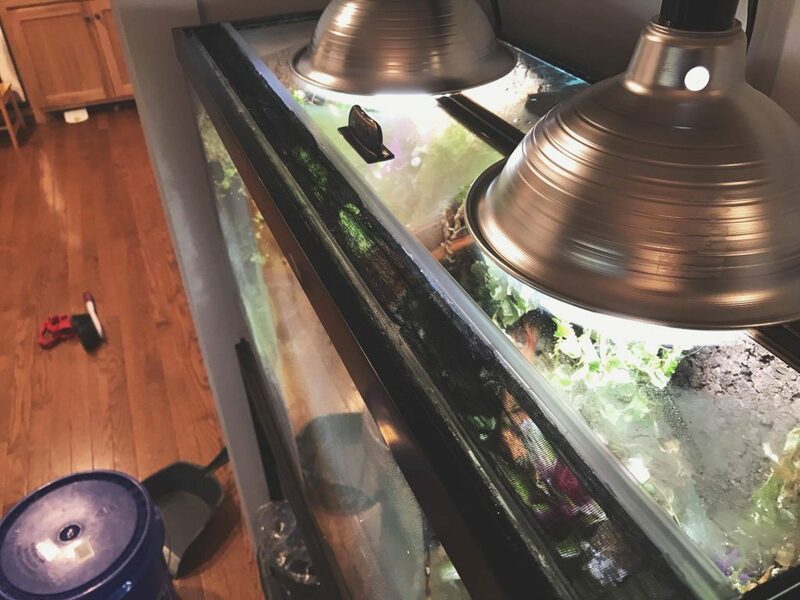 I’ve been asked recently how to set up a tank like mine, so I’m breaking it down step-by-step and including shopping lists for both a 5.5 gallon set-up and a 10 gallon set-up. I’m going to follow up this post with stocking recommendations for both set-ups and try to have as much as possible with links in one place. 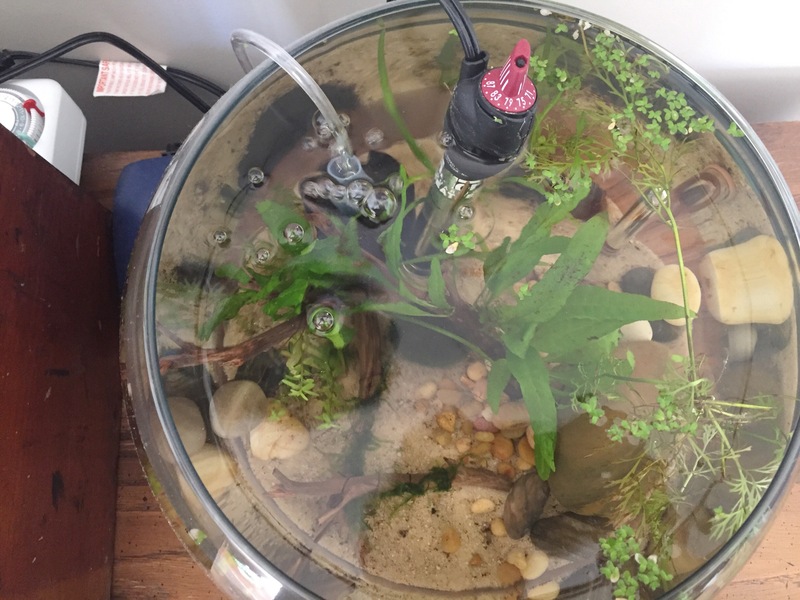 Disclaimer: I’m new to all this still (started my first tank May 2016), but I had to search a lot of places to assemble the method I’m using and I’m trying to reduce that search for you. But as always, do your own research too. 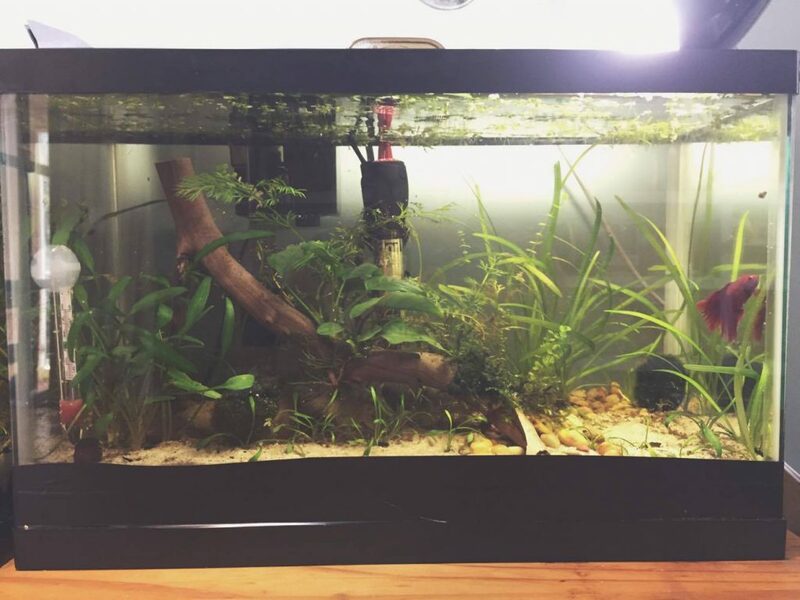 Also, I only know one way to do this as natural planted, low-tech tanks are what appeal to me so it’s what I learned. I can’t answer your questions about how much CO2 to do or anything else like that. 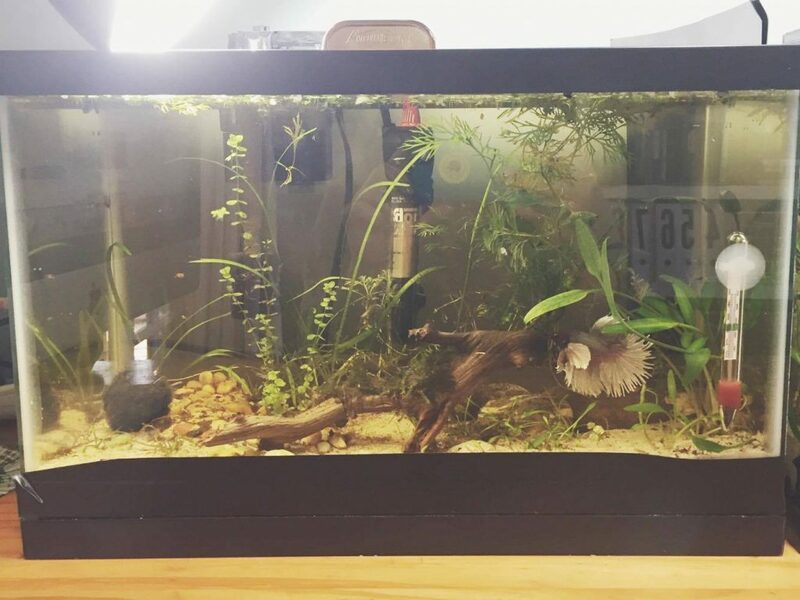 But if you want a detailed guide to a natural planted, dirted, nano tank for your betta or other nano resident, you’re in the right spot. 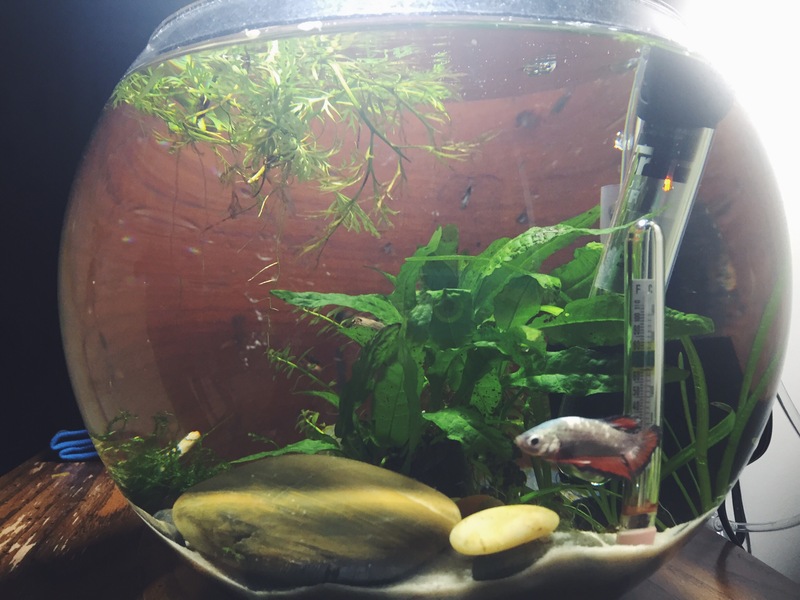 I’m not explaining the nitrogen cycle in this post, I just walk you through how to set up a tank to “silent” cycle so you don’t get ammonia and so you can add fish sooner. You still need to understand it, so go read up on that! Go shopping and make an Amazon order! You won’t be able to proceed until you get these things! 1-creeping Jenny plant if you can find it (if you buy this, soak it completely for a few days before planting it in your tank). Azoo Mignon 60 Filter (sometimes on sale for $6.99 here). 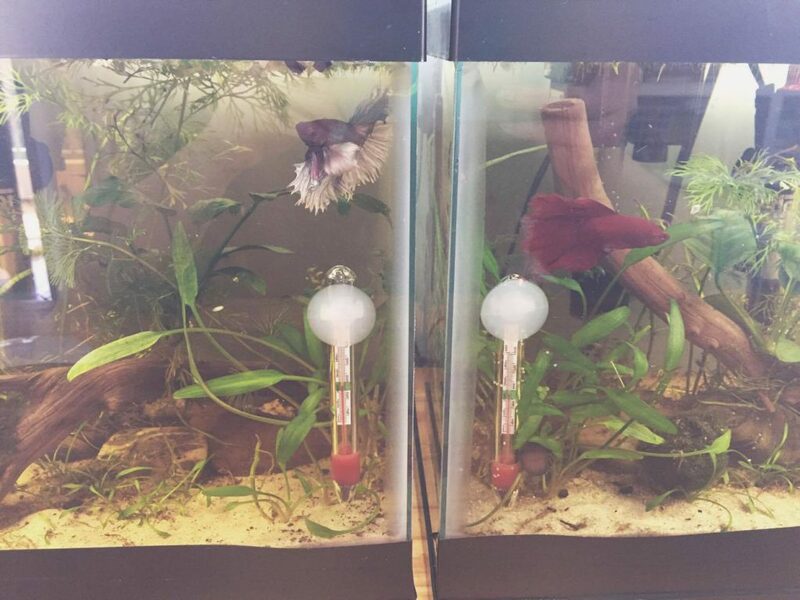 Marina floating thermometer with suction cup (if ordering from Drs Foster and Smith, it’s only $1.99). 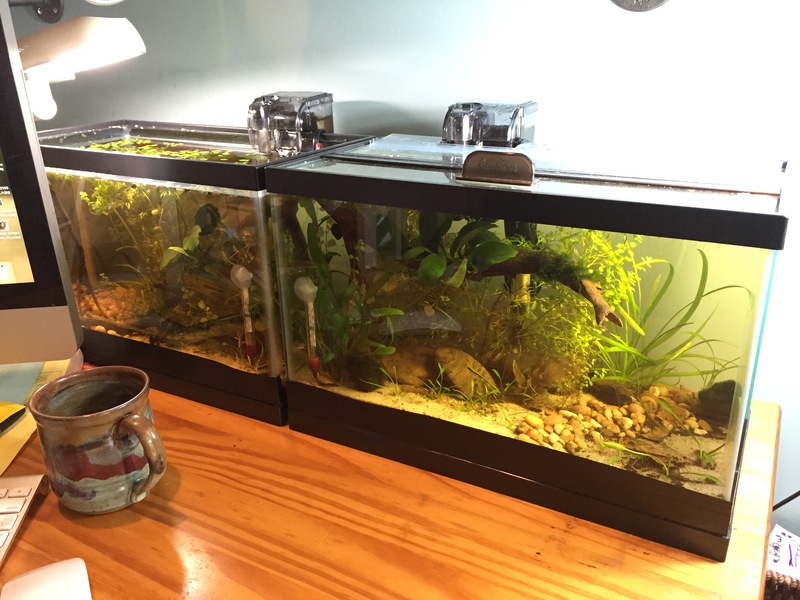 Tank: I use standard Aqueon black rimmed tanks from Petco. 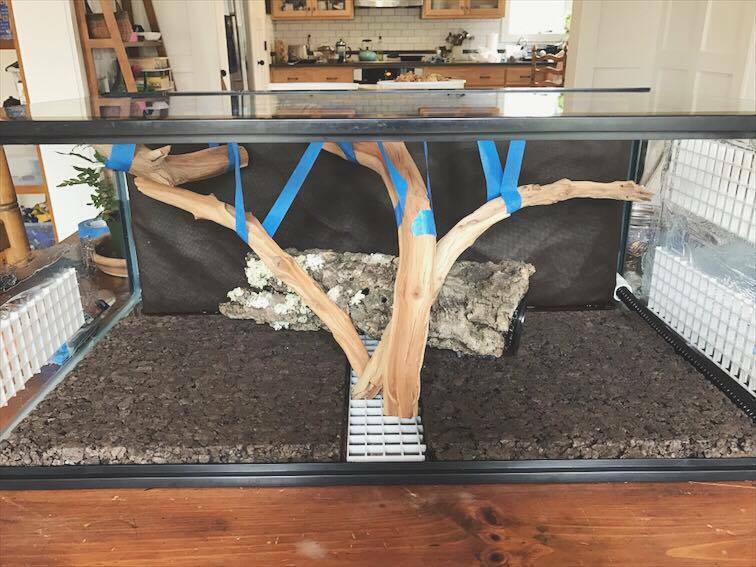 You can also buy glass canopies there, or your local fish store, or on Drs Foster and Smith (they have free shipping on orders over $19. 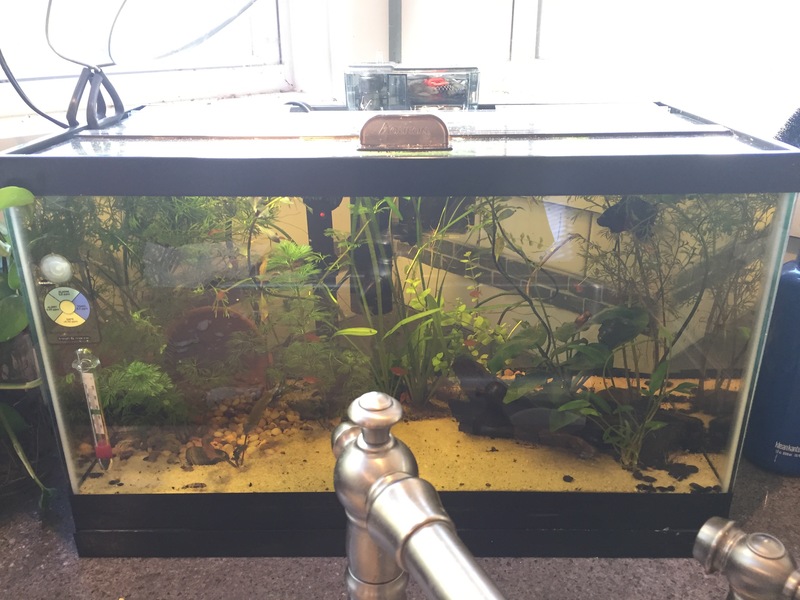 It takes about a week, but you can get your Aqueon Versa Top, Theo heater, thermometer, and Mignon filter all in one go for your 5.5 gallon that way). Hardscaping: Rocks and driftwood. 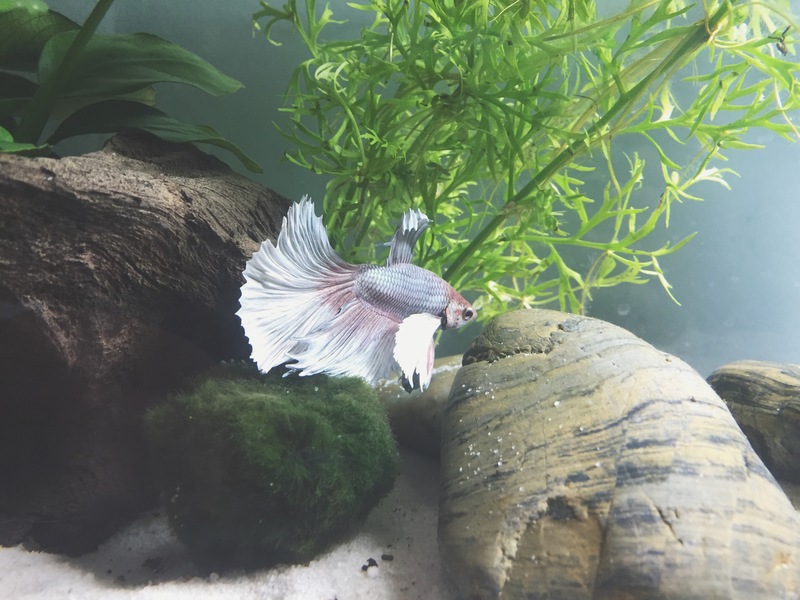 I use what’s called Zebra rock and also just larger river rocks I got at Petco. My LFS sells rock the pound and has a lot more variety. 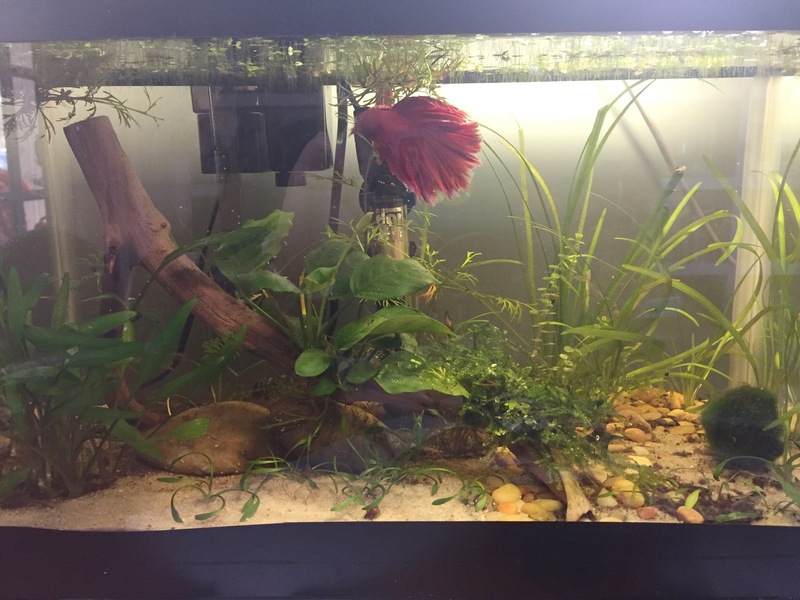 I also added Manzanita branches with anubias tied on purchased from Manzanita Driftwood. Frozen food: Buy frozen (not freeze-dried!) bloodworms and daphnia (and brine shrimp if you want to) and stash them in your fridge. If you’re feeding just one fish, you can thaw some and keep the extra in the fridge for up to 1 week. I feed frozen food in rotation, alternating with pellets, usually every other day. 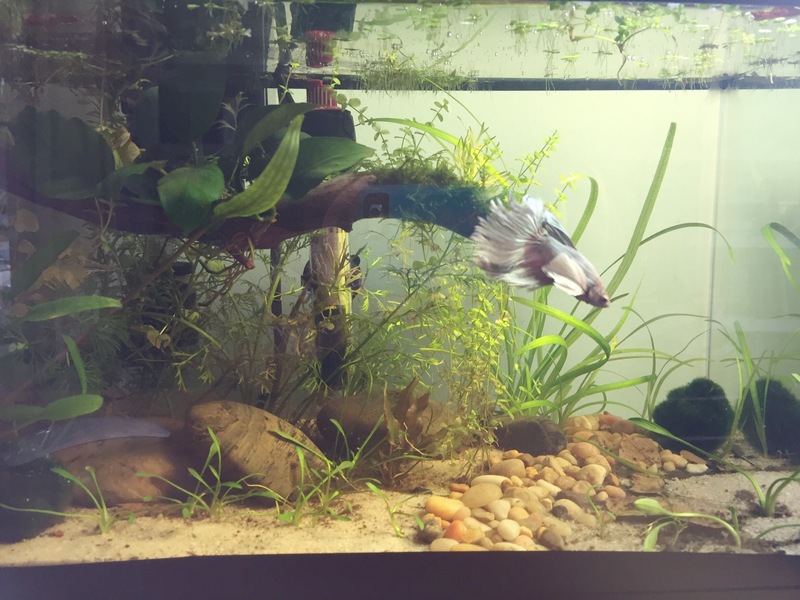 DON’T buy your plants until the day you’re ready to plant the tank (except the creeping Jenny if you’re using that as mentioned above). General aqua scaping rule of thumb, pick one kind of rock and stick with it, it will unify your aquascape. 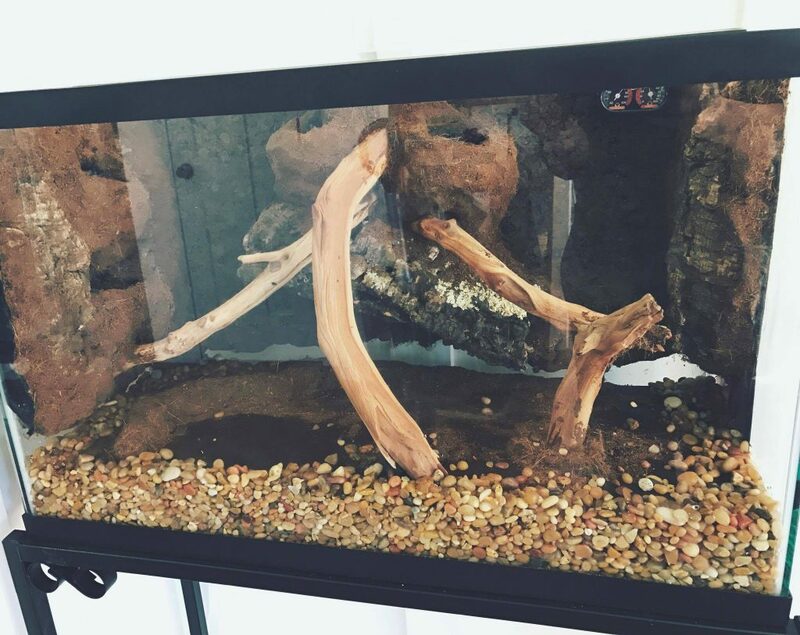 Use rocks and driftwood sold for aquarium use to be sure they won’t mess with your pH or introduce chemicals that are unsafe for your fish. DON’T BUY ANY FISH YET! I know it’s tempting, believe me, I know! But you need to be set up first. 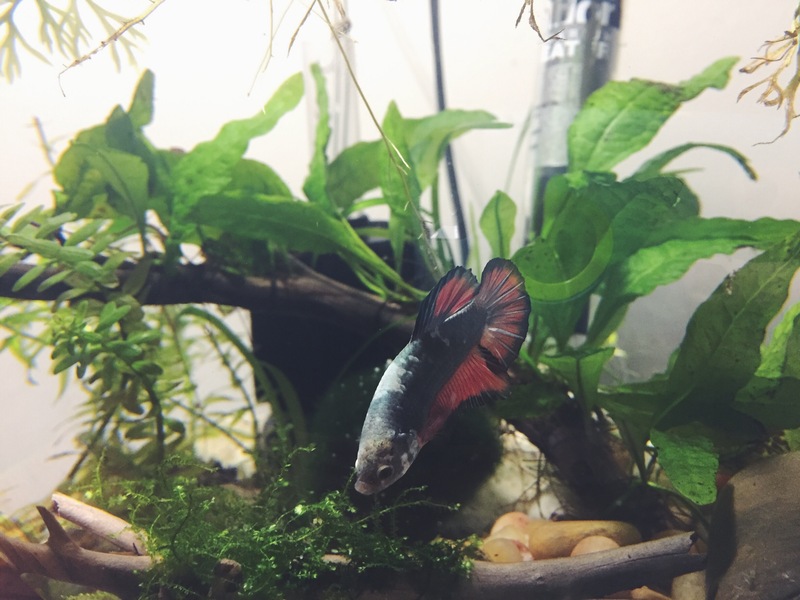 Assuming you’ve gotten your Amazon order and found all the items listed to get at the home improvement store, you can now go BACK to the fish store and pick out your plants. 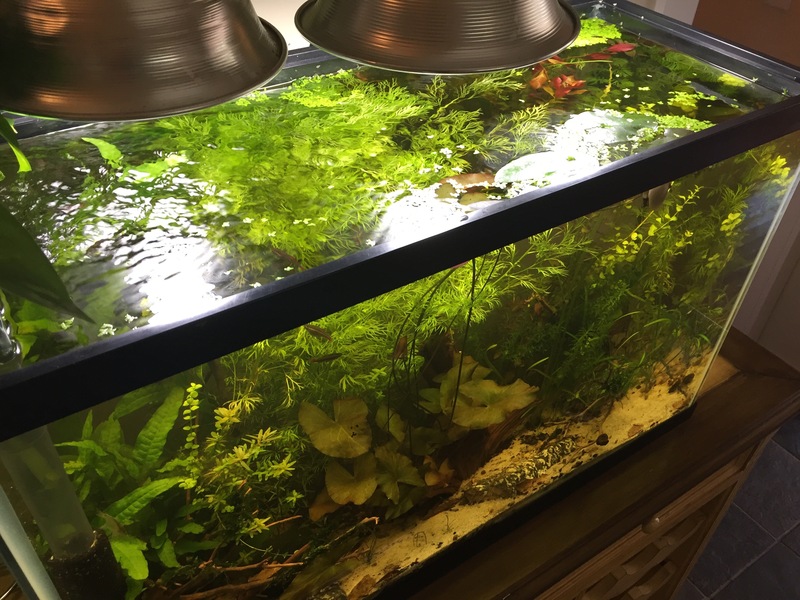 I’d stick with plants recommend for 5-10 gallons in the The 101 Best Freshwater Nano Species: How to Choose & Keep Hardy, Brilliant, Fascinating Nano Fishes, Plants & Invertebrates (Adventurous Aquarist Guide). 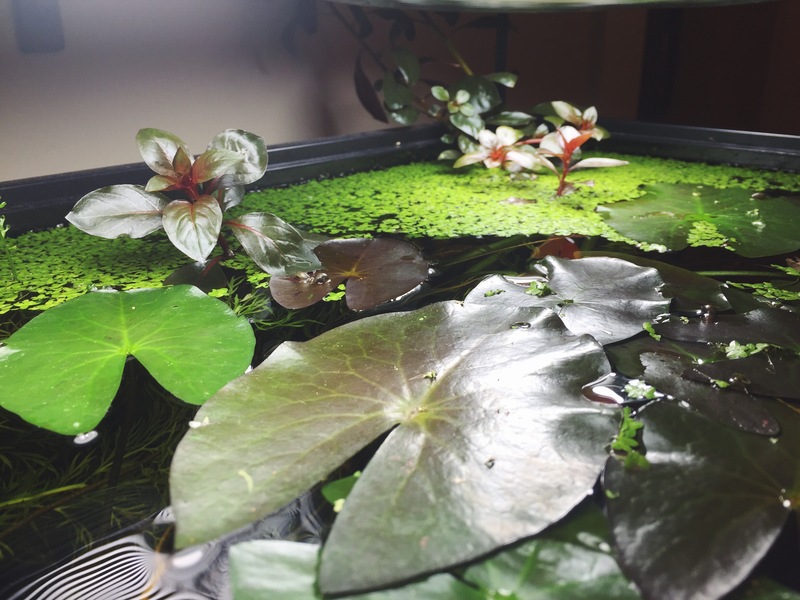 Plants: see plant section in The 101 Best Freshwater Nano Species. This article is also very helpful. 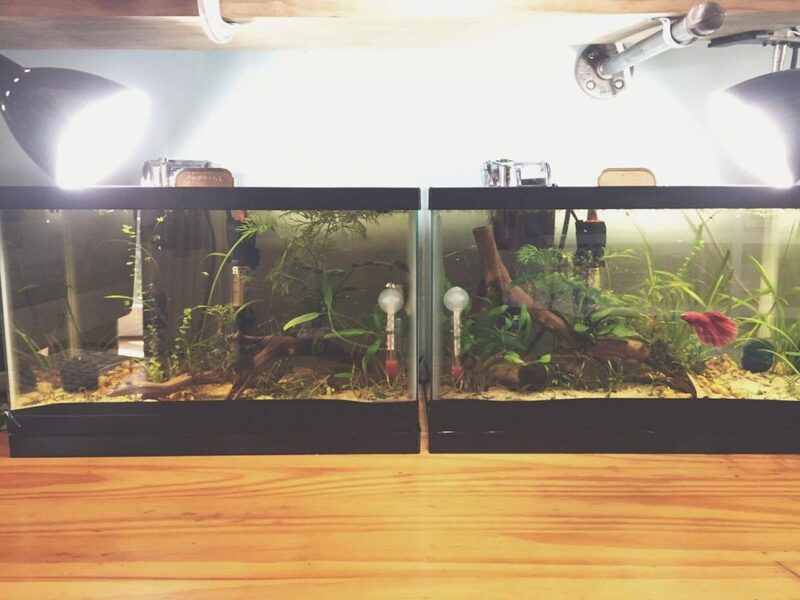 IMPORTANT: Get enough plants to plant AT least 50% of your tank (as viewed from above). You need to start out heavily planted for this to work smoothly. Step 1: pour about 8-10 cups of sand into one of those handy five gallons buckets you bought and rinse it, as in agitate it, and pour the water off about 5-6 times. you should see the water settle back on it clear after that. this will keep you from having to drain and refill the tank multiple times. Step 2: put 1 to 1 1/2 inches of soil in the tank. Pick out the largest pieces of wood, but you don’t have to spend a ton of time on this step, the wood will get waterlogged under the sand. Step 3: Mist the soil with your hose or a spray bottle that’s never had anything else in it, like anything. Don’t rinse a spray bottle you’ve used for something else. 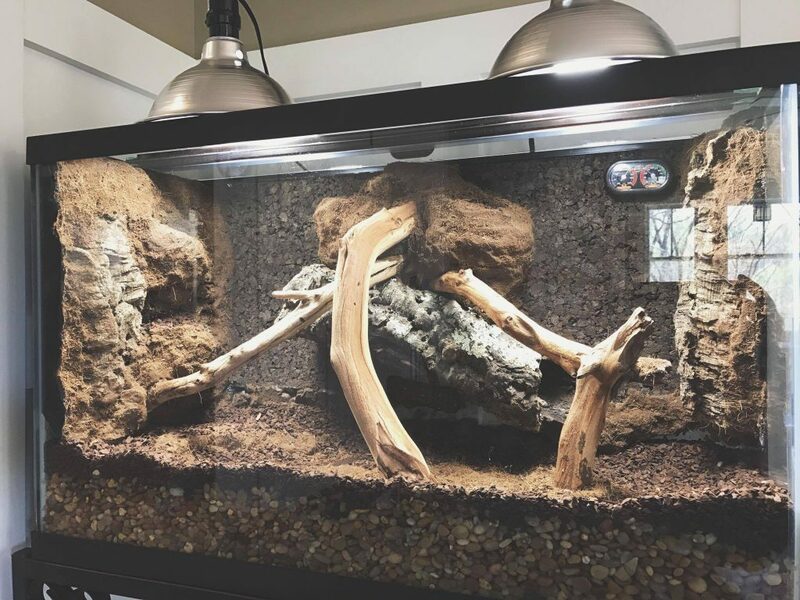 You can also just pour water in: get it thoroughly wet, but not a mud puddle, you don’t want standing water at this stage, it’ll just make your tank water dirty. Step 4: Add your rinsed sand one inch deep over the soil. 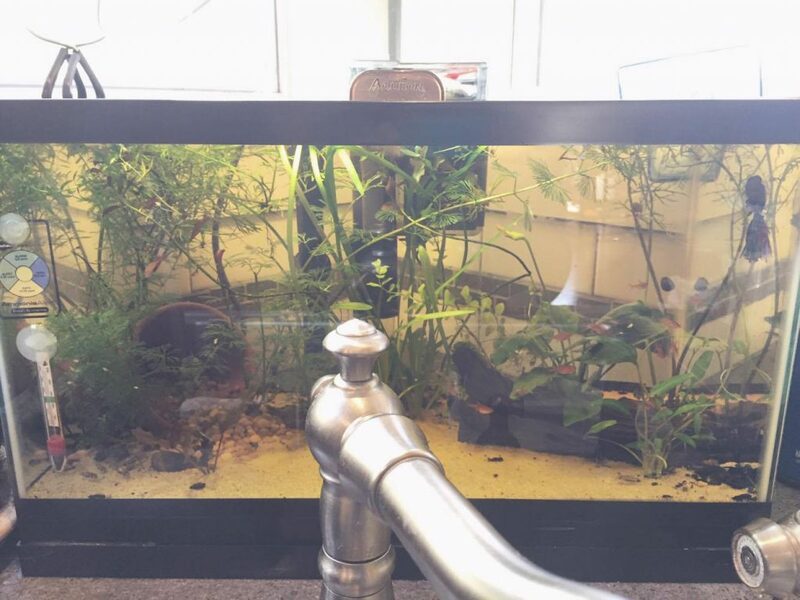 Step 5: Put the tank where you want it (remember even a 10 gallon tank is going to weigh about 100 pounds when it’s full. Make sure you have something that will support the weight). Make sure it’s dry underneath. There’s no moving it after this unless you drain it. Decide where you’re going to put the filter and leave at least 4 inches of space (for the filters I’ve recommended, if you choose a different filter you may need more!) for that between the tank and any wall. Step 6: Put a plate on top of the sand and fill the tank half way. This doesn’t have to be conditioned water, you may want to empty some of this back out. Step 7: Take the plants out of their bags. If they are groups of stems, remove the weight band thing. if they are in pots remove them from their pots and take off any of the weird wool stuff they grow them in without damaging the roots as much as possible. Inspect them for any algae and either rub it off with your fingers or remove affected leaves. Rinse them off. Step 9: Let everything settle and decide if you need to take water out, or just skim off any pieces that floated up. Step 10: Fill tank to bottom of black band. Step 1: Add Prime to your tank, about 12 drops from an eye dropper if you have one, or you can estimate with the lid according to the instructions on the back. Step 2: RINSE about a handful of the Matrix if using the Palm filter until the water is clear! If using the Aquaclear, rinse the included bio-media in the included mesh bag very thoroughly. Step 3: Set up the filter. (will add a video later of how I have mine set up). Step 4: AZOO: put one of the included sponges in the front of the filter, vertically behind the outflow. Then: Put the rinsed Matrix in the filter box, evenly spread out. Follow included instructions to prime filter AQUACLEAR: Put the sponge in the bottom of the filter basket followed by the mesh bag full of bio media. 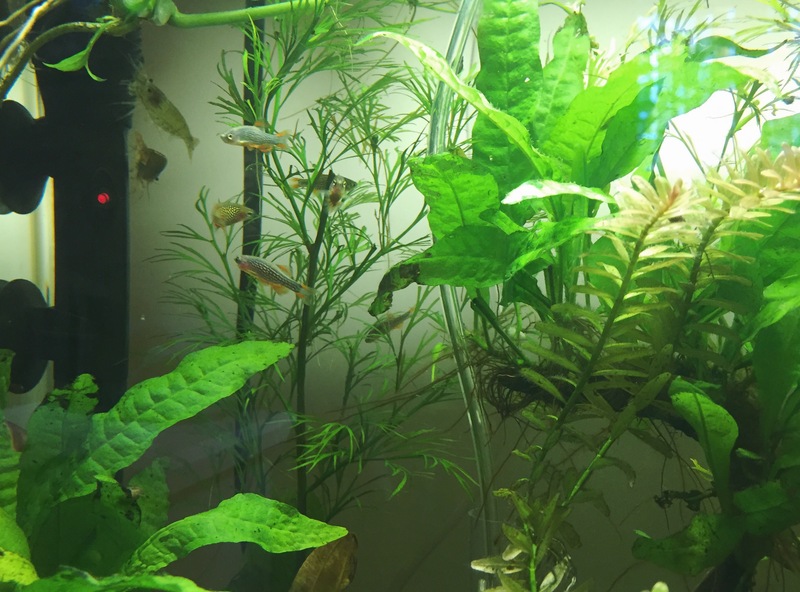 DO NOT use the carbon, it’s not intended for planted tanks and will take nutrients out. Follow instructions to prime filter. Step 6: Set up the heater: IMPORTANT. Poorly written instructions on the Aqueon heater. AFTER you submerge it, WAIT 30 minutes before you turn it on. It does say this but it’s in a bad order. Otherwise, you can follow the included instructions. 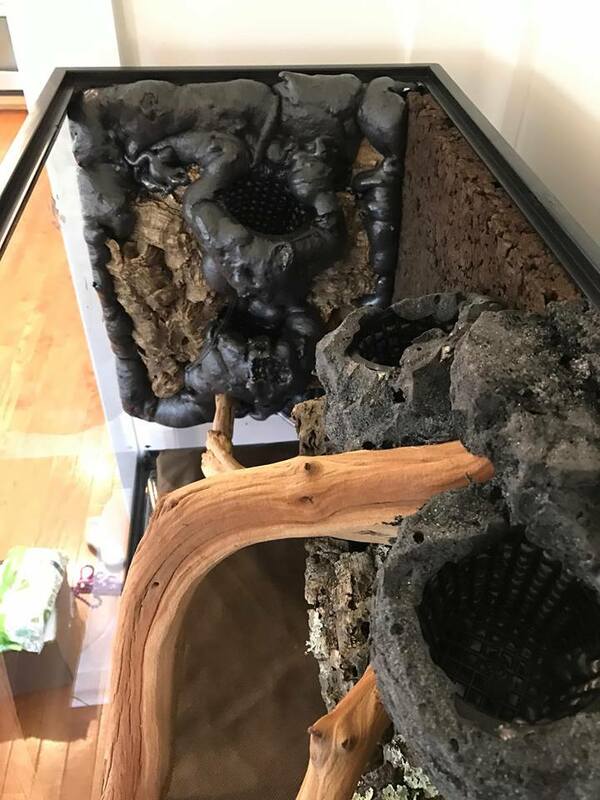 Also, when doing a water change, unplug the filter and the heater first! If you run the heater dry, it can malfunction and fry your fish, either by heating them because it doesn’t cut off or electrocuting them. It doesn’t happen often, but it’s a possibility, so let’s not have that happen! Supposedly the Hydor heater doesn’t have that problem but I’m still turning it off to be safe. Step 7: Filter should be running nice and smooth by now, add Stability to the tank according to instructions on bottle. 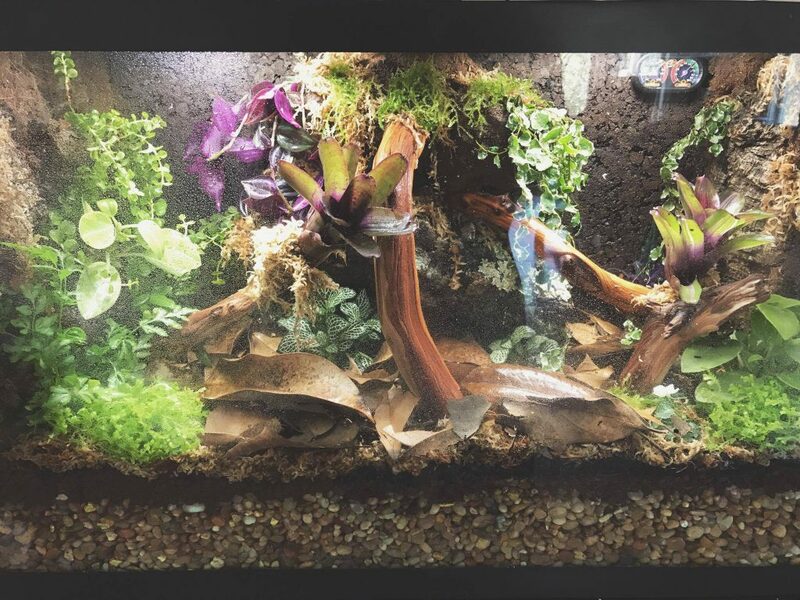 This plus the plants will make your tank cycle silently (meaning you can have the fish in and you won’t see an ammonia spike) once you add a fish or two. Make sure you add Stability according to the instructions for the whole week. Step 8: Set up the light and timer. 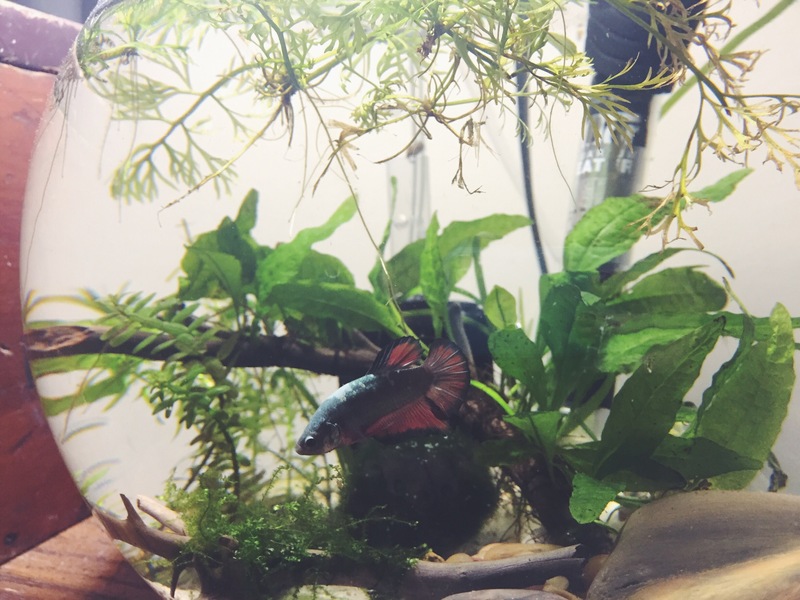 I just clamp my light to the side of my tank, or the shelf above so it shines at an angle from the long side. 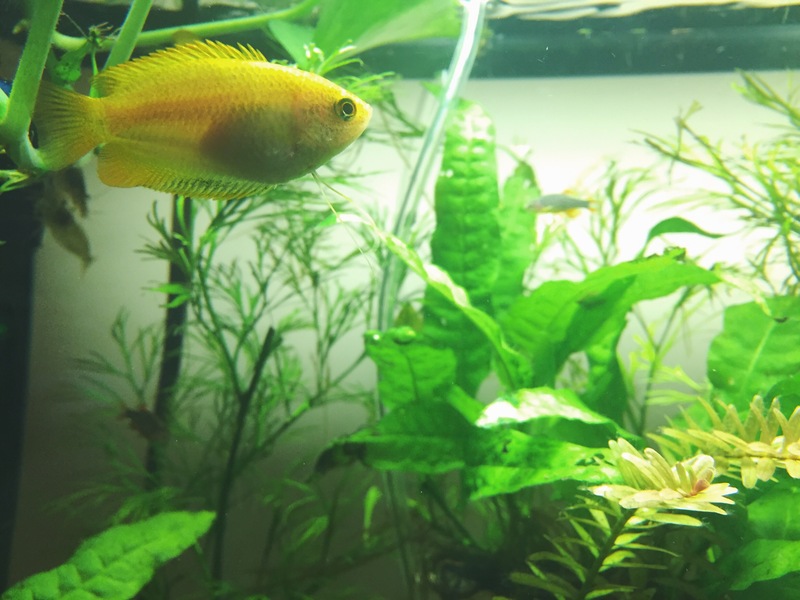 I plant my higher light plants near the light and the lower light plants on the far side of the tank. Set the timer for a 5 hours on-4 hours off-5 hours on pattern to start with. 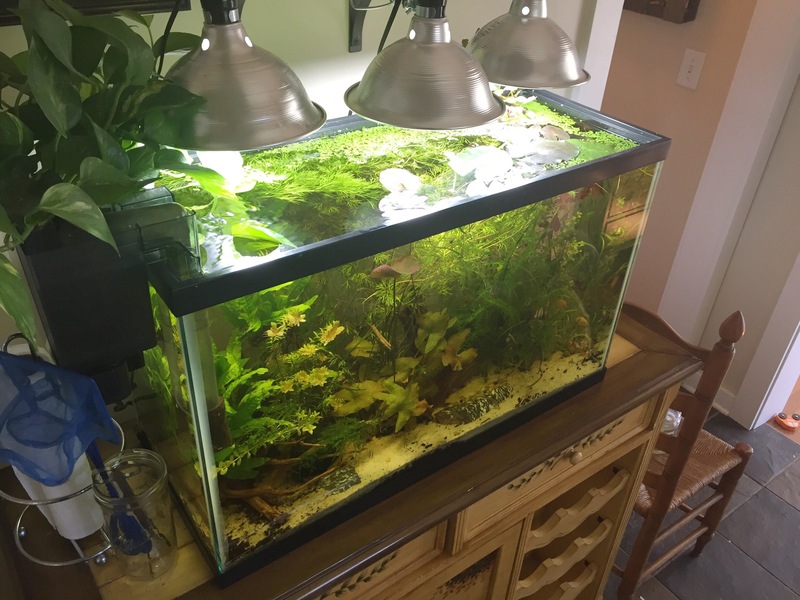 You many need more or less depending on things like how much algae you start getting (you have too much light), plants growing too slowly (you need more light), light coming from nearby windows (you’d need less from your lamp). 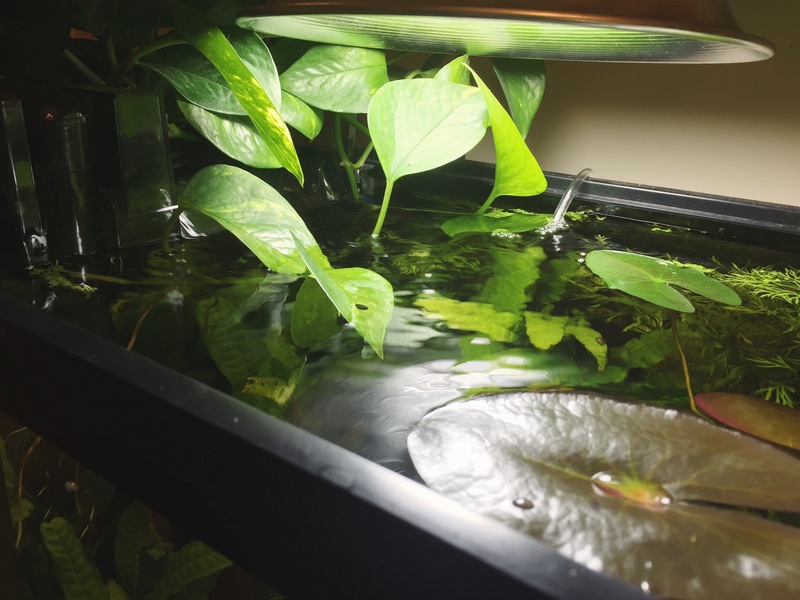 The “siesta” in the middle allows the natural CO2 levels to come back up and keeps you from having to add CO2 in most cases (double check your plants by googling them before you buy and make sure they say “easy” and don’t say they need high CO2). 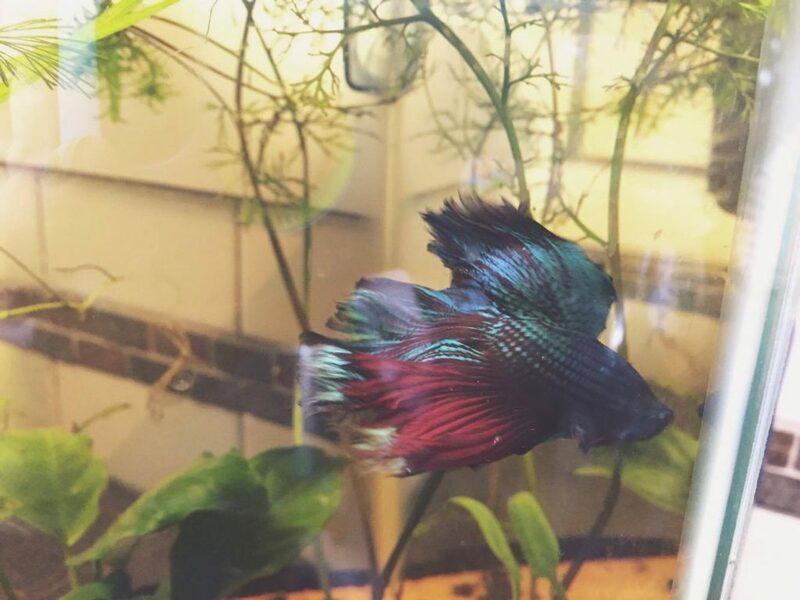 Yes, now you can go buy your Betta, or if you’re adding a schooling fish to a 10 gallon add 3-6 of those (to start with, the goal is 8-10 of a schooling species). 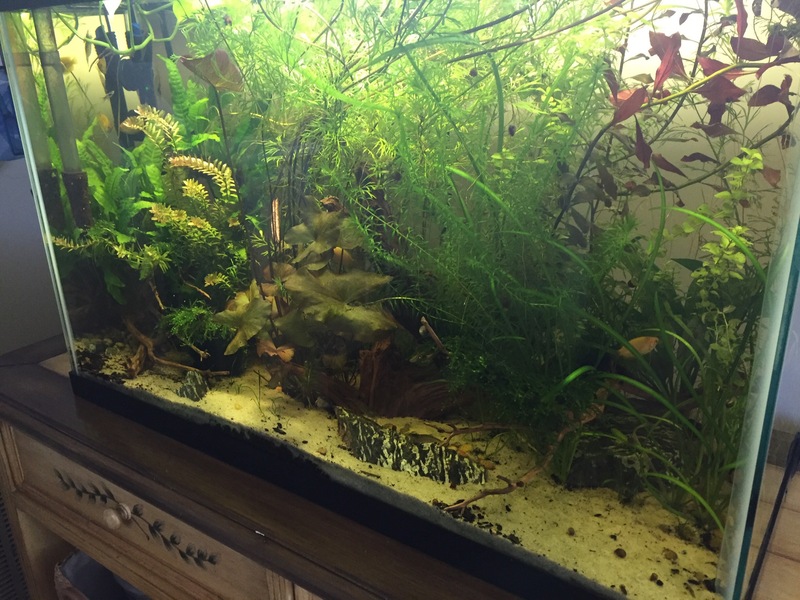 Don’t add dwarf or Amano shrimp at this time as you won’t have any bio-film for them to graze. Wait at least a month to add shrimp. Ghost shrimp on the other hand are scavengers and will eat left over fish food. You only want to stock about 20% every 2-3 weeks, until you hit about the 90% of recommended stocking on aqadvisor. Many other schooling fish are too large or too fast to be kept in a 10 gallon. All these are an inch or less. Plan on about 10 of each (again run your stocking plan on Aqadvisor and research!) because you’ll get more natural behavior that way. 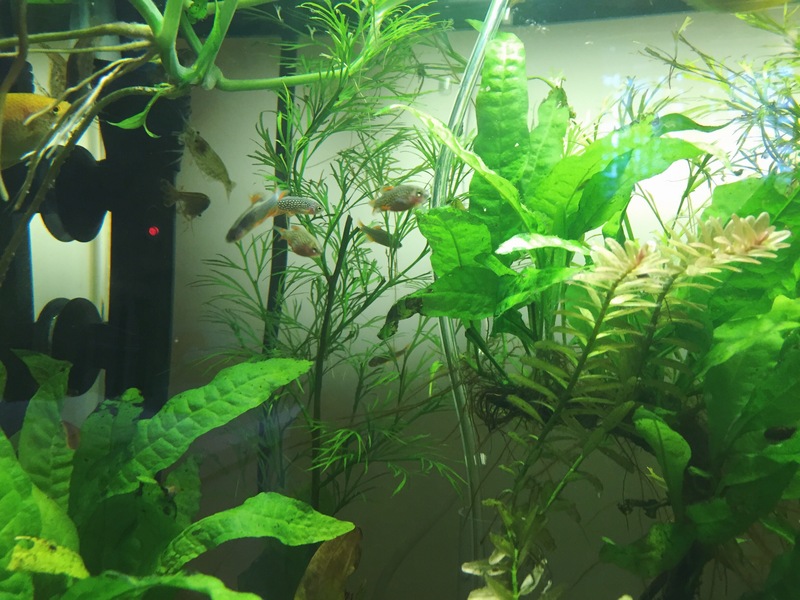 When I had 5 Ember Tetra they hid much of the time. With 12, they’re almost all out in front all the time. 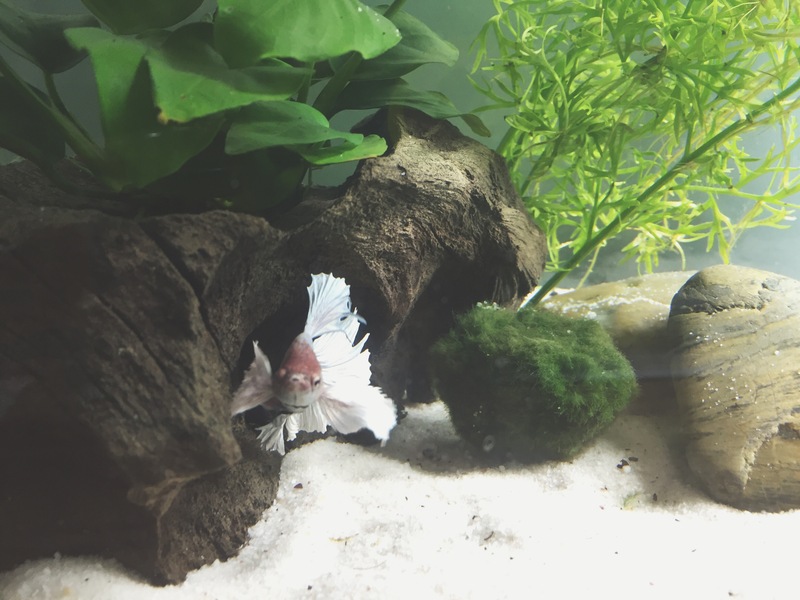 The Betta is super mellow and pretty much ignores them. 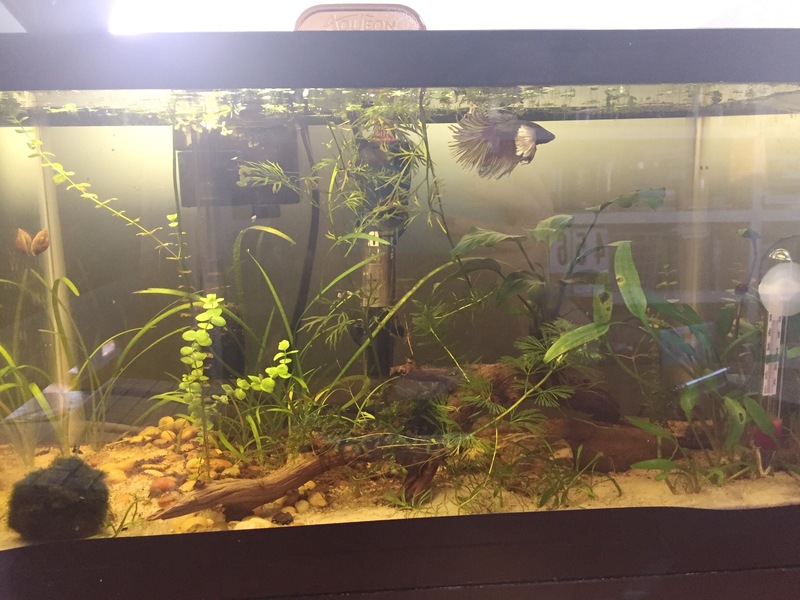 It’s recommended to only keep one kind of schooling fish with a Betta, and in a 10 gallon you only have room to keep enough of one species anyway. 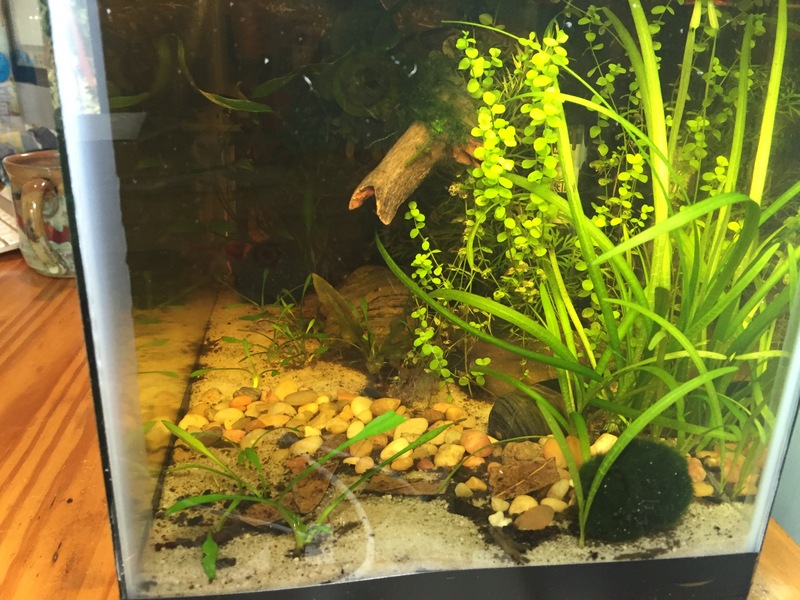 Non-fish tank mates can include: African Dwarf Frogs, shrimp (be sure they won’t become lunch! 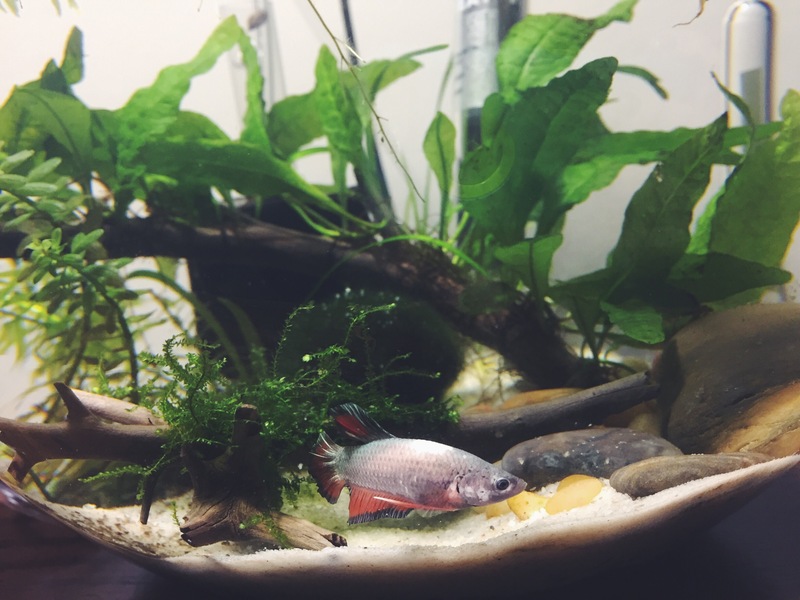 I tested my betta with a ghost shrimp before I added amanos to his tank), and snails (big bioload for some though, again, do research). Aqadvisor: helpful site for thinking about stocking options. When starting out stay below 90% and only stock 20% ish at a time, waiting at least 2 weeks before adding more. 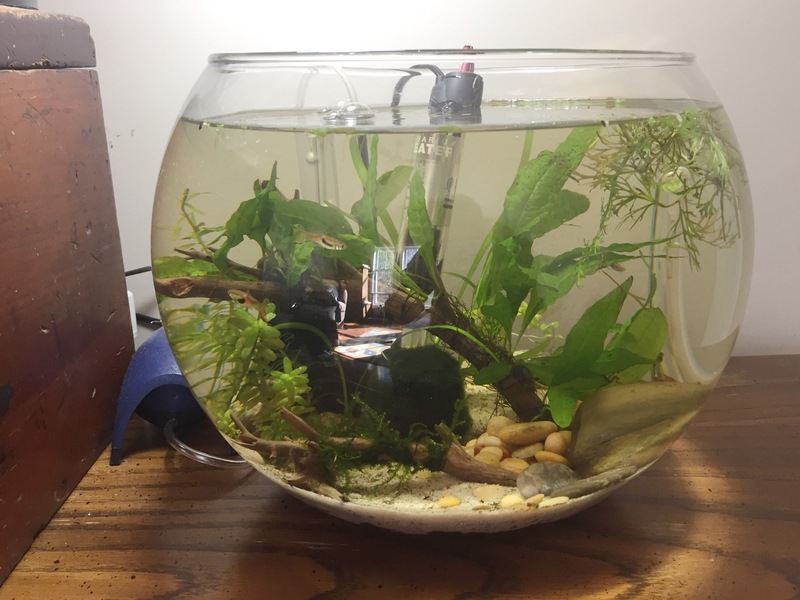 Forum thread on tank mates in a 5.5 gallon. It’s a big debate in many places, I’m still deliberating. 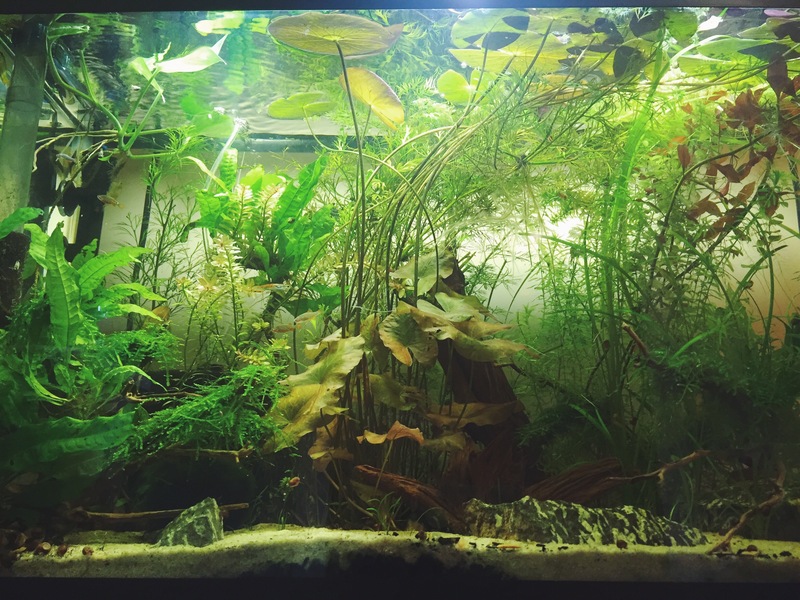 I think if I do try tank mates (other than 2 Amano shrimp and a nerite snail per tank, I will probably upgrade the filter, possible straight to Aquaclear 20’s, even if I have to baffle them some for the smaller tank).